Global Pavilion will be hosted in Hong Kong by University of the Arts London from 18-20 January 2019. UAL’s second major international pavilion explores 21st century ideas around migration, place and identity through the work of Hong Kong, Asian and European artists. Inside, the exhibition explores and destabilises narratives of displacement and subjectivity through installations, films, photos, sound, workshop and interactive material. It has contributions from three UAL colleges: Central Saint Martins, Chelsea College of Arts and London College of Communication. The exhibition elements from each college are specific and discreet but reflect common themes around migration, movement, public/private space and collaboration. The college contributions are curated by Katrine Hjelde, Course Leader Graduate Diploma Fine Art at Chelsea College of Arts, UAL. ‘Culture, Enterprise, and Co-Production’: Central Saint Martins showcases insights from the next generation of cultural practitioners, students and researchers. This speculative exploration of space and place represents personal identity, innovation and the complexity of cultural experience in the urban realm, with insights from Hong Kong, Tokyo and London. ‘Migrating Cities’: Chelsea College of Arts’ programme of performance and film considers Hong Kong as a place from which to engage with global diasporas. Continuing the International Curators Forum’s dedication to exploring global mobility and identity, Migrating Cities will explore, question and destabilise certain narratives around migration in relation to the practices of a group of international artists. ‘Space: the Public and the Private’: London College of Communication works with Hong Kong artists and students to address the divisions of private and public space and the experience of high-density living. This collaborative journalism and art exhibition includes photography, a zine-making workshop, an artist-led workshop and a dynamic Flickr-based debate, co-produced with festival visitors. Local contributing artists include Alison Chan, Wesley Ho, Ramond Ho, TAM Hing Kai, Goby Lo and Pien WU. On Sunday 20 January, UAL Vice-Chancellor Nigel Carrington is the keynote speaker in a panel event at Herzog & de Meuron's JC Cube auditorium, sharing thought leadership and experience on the role of universities as placemakers; referencing shared connections between the UK and Hong Kong and the significance of major cultural expansion projects currently underway in London and China. Global Pavilion is one of the highlights of the British Council festival SPARK: The Science and Art of Creativity; a new platform for the exchange of creative ideas between the UK, Hong Kong and the North East Asia region. 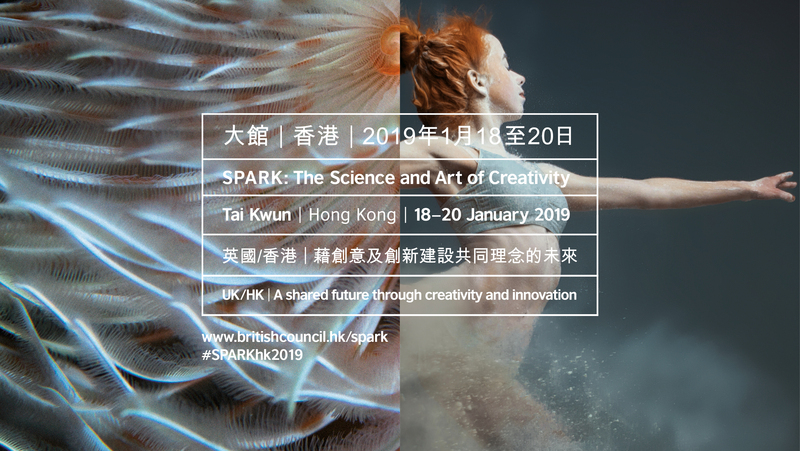 SPARK will see Hong Kong’s contemporary hub for arts and culture, Tai Kwun Centre for Heritage and Arts, host over 50 creative and education partners from the UK and Hong Kong. After the three day festival, the pavilion structure will be dismantled and moved across the harbour, to take up residence at the Academy of Visual Arts at Hong Kong Baptist University (HKBU). “The Academy of Visual Arts is delighted to facilitate the continued presence of UAL’s Global Pavilion at our Kaitak campus after the SPARK Festival. Kaitak is a Grade I listed heritage building and one of only 12 UNESCO acknowledged sites in Hong Kong. The pavilion’s innovative design will be a striking addition to our campus and enable us to extend the range of AVA’s performative and event-based activities. It will offer our students and visiting artists new opportunities to work within the context of a unique structure. The exhibition will be housed in a purpose-built pavilion designed by locally-grown Hong Kong architects, HOUR25 Production. Juxtaposed against its location in the prison yard of the former colonial Victoria Prison in Tai Kwun, UAL Global Pavilion will materialise as a translucent polycarbonate structure framed by arched colonnades. Designed to adapt to its site and conceived to feel porous and accessible on all sides; inside, the 170 square foot structure will create a semi-privacy and atmosphere of intimacy. Using modular prefabrication, the pavilion will be constructed in advance and erected on-site by another local team, Hattrick Creative. This is very much a collaborative project so my role as curator is to provide a coherence to the three UAL college exhibitions taking place within the pavilion. Initially these were conceived as separate entities both in terms of the exhibition itself and as different strands of enquiry, spanning art and design. So, there is a formal aspect to my role, ensuring the different exhibits are curated ‘together’, even as our different colleges are also very much involved in curating their contributions. For UAL and the other universities involved, taking part is an opportunity to respond to the aims of the festival as well as critical issues of migration, living, transportation and identity in relation to Hong Kong, but also more widely; exploring and destabilizing current narratives of displacement and subjectivity in a global context. As well as ensuring that the different exhibition elements will work together, I will oversee how the elements work with the architecture of the pavilion and the conditions we have regarding light, sound and environment. As such I work closely with the three colleges’ curatorial teams as well as colleagues in UAL’s International department, and all of our partners in Hong Kong. In particular I work with the designers HOUR25, because the pavilion as a site – on the grounds of Tai Kwun Centre for Heritage and Arts – is central to this event. As a Fine Art Lecturer and Course Leader at UAL I am also interested in the ‘didactic aspect’ of the exhibition and how it will also be communicating UAL’s innovative and very international and outward facing approach to the teaching and learning and ‘making public’ of art and design. UAL is a world-leading art and design institution and through Global Pavilion we will bring together local Hong Kong, Asian and European artists in high level international art design collaborations with three different UAL Colleges. The different exhibitions taking place are related to connected strands around migration, identity, urban space and showcase these fantastic artists and designers, many of whom in different ways link to UAL. SPARK will be a fantastic creative showcase and we hope everyone who visits the festival will come to see the UAL pavilion. It will be a beautiful structure that has been designed specifically with the exhibitions in mind but also in relation to the vernacular architecture of Hong Kong, the Tai Kwun centre in particular and HKBU where it will go finally. At night, the pavilion will become like a sculptural lantern, but the exhibition elements can still be seen. We are very excited to be trusted by UAL and to be given this opportunity to work with the space. I would say there is a beauty in the drive to design and create the pavilion as a conversation between the heritage and the present-day; the permanent and the transient. Tai Kwun Centre for Heritage and Arts is based on the site of former Victoria Prison, representing colonial buildings and a historically significant setting. It opened this year after a ten year renovation – and it’s now one of the most prestigious arts and culture destinations in the city. Not only does it have a colonial past, but it forms Hong Hong’s largest colonial cluster of buildings so it’s very special – and the setting for the pavilion is also unique, set in the prison yard surrounded by these old buildings. The starting point for the design was the materiality of the pavilion and how that would work for the setting of the prison courtyard, which retains a heavy wall on one side and is surrounded by the old colonial buildings. All these materials are very solid and rustic so we wanted to create a contrast with these attributes and use translucent materials, so that it would not be like situating an awkward object in the middle of this. We understood that the space was not to be formal, but would require a covered area that could host performance, installation, art and display as well as free projection, so we wanted to design with these elements in mind. The second consideration was the temporary nature of the structure and the idea that the pavilion would only sit for a very short term in this location and that there was a desire for it to then be moved to HK Baptist University to take it over, so the building would need to be modular, capable of being erected at speed and transportable - a migrating pavilion. It’s not designed as an absolute; it has the potential to respond according to the site where it is based. A world leader in art and design education, UAL welcomes large numbers of Chinese students to the UK every year. Hong Kong is a key creative base for UAL and a growing market for talent in the field of arts, creative and cultural management. Hong Kong is home to nearly 3,000 UAL alumni, and a further 7,000 UAL alumni live and work elsewhere in China. Last year students graduated from UAL Masters programmes at the HKU School of Professional and Continuing Education (HKU SPACE). This is the first time the qualifications have been delivered outside of London by UAL academics working with HKU Space as an accredited partner institution. The partnership started six years ago, anticipating the need for a home-grown workforce of multi-skilled professionals, executives and entrepreneurs in Hong Kong. UAL partners in Global Pavilion are Hong Kong Baptist University; HKU Space; International Curators Forum, HOUR25, Hart Haus; Tokyo University of the Arts: GAP; Hattrick Creative Limited.